Fundamental change — it’s the beating pulse of every revolution, paving unchartered roads for new ideas to be conceived. 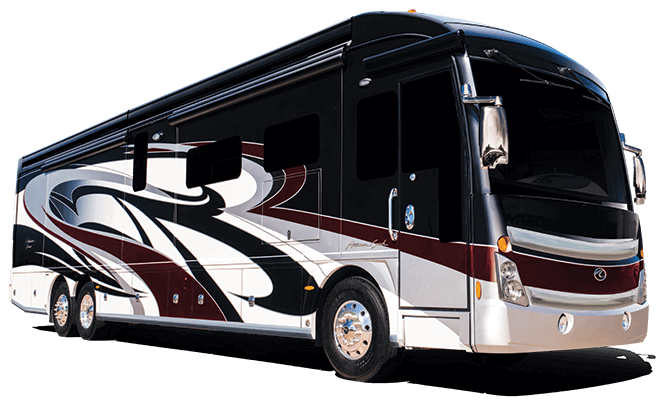 Take for instance the American Revolution RV, the epitome of luxury redefined. 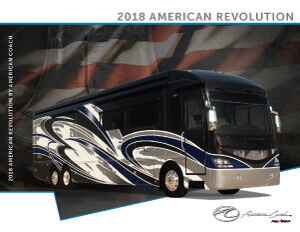 Built on its own exclusive Liberty Chassis with a 450 HP Cummins engine, the American Coach Revolution unlocks a world of freedom for those looking to step up into a Class A luxury motor coach. Surround yourself with gracious amenities and impeccable style when you set out to conquer the open road. You can’t lead a Revolution down the road without the right arsenal. American Coach’s industry-first, dual-dash monitor design with automotive wrap-around puts your cab’s most essential touchscreen displays within easy reach. The American Revolution cab also features Villa Ultraleather driver and passenger seats with heated seats, reclining back, adjustable arms and slide controls, while the Denso delivers high-output A/C and heat provide ultimate comfort. The American Revolution features four LED HDTV televisions, including a 50” Sony TV in the living room nestled near the electric fireplace for a cozy setting. A sound bar and TV antenna complete the living area’s entertainment offerings. The coach also features a 32” TV at the front of the coach and another one in the bedroom, and for outdoor enjoyment, relax around the exterior Sony 42” LED TV under the roof-mounted awning. American Coach prides itself on the American craftsmanship poured into each coach, and in fact, it’s nothing short of meticulous. Every tile is laid by hand, and the floor itself is made of polished porcelain for enduring durability. Heated floors create an inviting experience, while decorative backsplash in the American Revolution’s galley and bathrooms provide impeccable styling. Modern crown molding and hardwood window treatments complete the package. The American Revolution offers a variety of intimate dining configurations, tucked near the electric fireplace for added ambiance. Choose from standard face-to-face seating or opt for the facing dinette configuration. Surrounding hardwood cabinetry in satin or high-gloss finish complement the dinette’s solid-surface counters. Comfortable chairs in Luxe Truffle or Moon Haze décor add the final touch. The residential touches are endless in the American Revolution. Doors are trimmed in hardwood, while a pocket door with glass insert creates a welcome entrance to your very own private master suite. The bedroom passage door features an integrated latch to secure the door during travel, while double roller shades add to your coach’s privacy. And what’s a master suite without your very own entertainment center? American Revolution’s full-featured rear bath is a welcomed retreat after a day of travel. In fact, the 42S’ shower is so spacious, a bench seat creates a spa-like appearance, while the Aqua-Hot heating system provides on-demand hot water. A porcelain Macerator flush toilet with a San-T-Flush tank system is as residential as it gets, and each American Revolution floorplan features a half bathroom for your guests, in addition to the private rear bath. 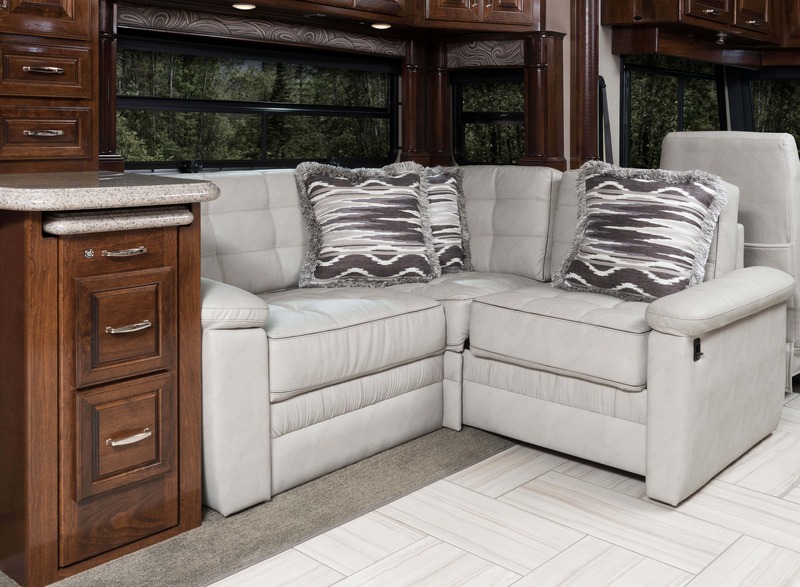 When wardrobe space is as thoughtful as your motor coach’s galley design, you know you’ve stumbled upon luxury. From wardrobes that span the full width of the coach to the 42Q’s very own walk-in closet, there’s room for the full attire. Cedar lining, carpeted floor and wire organizer are only the beginning to these spaces’ intuitive details, while the mattress lifts up on struts to reveal select model under-bed storage for your seasonal wardrobe. The Cummins ISL9 powers the American Revolution. Delivering a 450 HP ride with 1,250 lb.-ft. of peak torque, the ISL9 has the highest power-to-weight ratio for strong towing capacity and features two-stage engine brakes and an Allison 3000 MH 6-speed transmission. 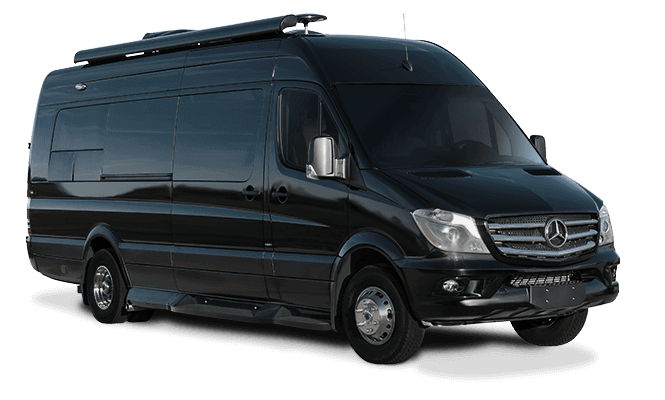 Ready to revolutionize your own motor coach? Use our Build and Price feature to handpick your own interior décor, paint package and optional features to create your very own 2018 American Revolution. 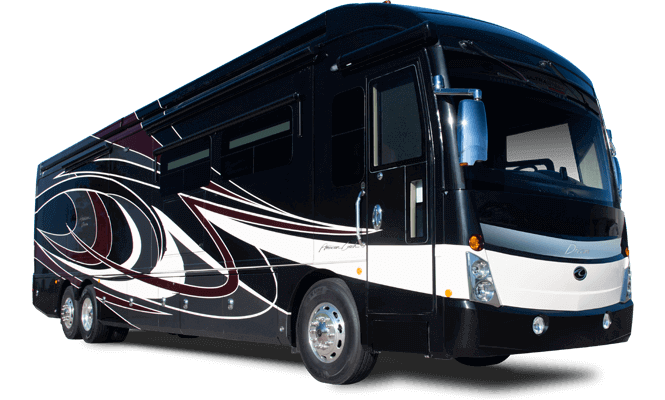 American Revolution is backed by American Coach’s RV OWNERCARE warranty program, a limited one-year/15,000-mile coach warranty and three-year/45,000-mile structural warranty, whichever occurs first. And with each warranty comes a network of trustworthy dealers and regional technical centers ready to get you back on the road.